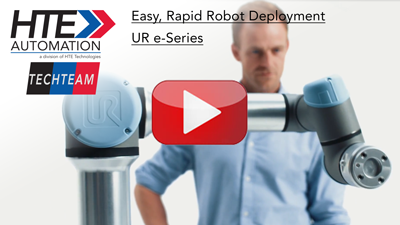 The e-Series of collaborative robots from Universal Robots incorporate numerous technological advances borne out of UR's more than 60 related patents, putting rapid ROI robot automation into the hands of even the smallest manufacturer. Transform your business as you unpack, mount, and program your robot in under an hour. And then, use the online Universal Robots Academy to give yourself or even non-engineer colleagues with no prior automation experience, all the training needed to effortlessly create tailored automation solutions. Universal Robots has revolutionized the field of automation by taking robots out from behind costly and space consuming safety cages, away from highly trained and compensated robotic engineers, and into the common, highly flexible work-cells where they “rub elbows” with production workers. With three models to choose from, now you can have highly productive machines working in a variable and flexible manufacturing environment while cooperating with people and other machines, and delivering unparalleled work-cell productivity.